World Individual Championships 1991: World Final : 6 pts, 12th 1993: World Final : 7 pts, 10th 1994: World Final : Reserve DNR From 1995, World Championship Grands Prix: 1995: 5th place - Winner - Austria 1996: 1st place - Winner - Sweden & Denmark 1997: 2nd place 1998: 9th place 1999: 18th place 2000: 2nd place - Winner Czech & European (Wroclaw) 2001: 6th place - Winner Czech 2002: 10th place 2003: did not compete. Billy became a Heathen in 1990, a year later than Greg Hancock, but his immediate progress was arguably more rapid. However, Billy's average was then curtailed at about 8-9 points over a few seasons due to injury and a short spell when he couldn't agree terms with the club. 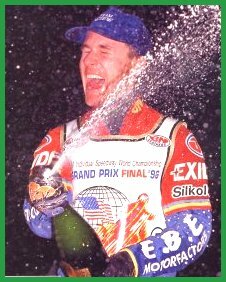 The major breakthrough to speedway superstar status came in 1995 when he topped the league averages and had his first successful world championship finish. 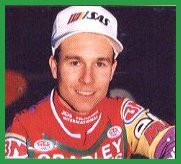 In '96, he repeated the feat in the British league averages and went all the way in the Grand Prix to become World Champion, while riding for Cradley at Stoke. It is inevitable that Hamill and Hancock will be compared to each other, and very often referred to as a pair, rather than two individuals. This only goes to show what a formidable partnership they formed at both domestic and international level. Hamill's style and natural ability on a bike is of a truly world class standard in modern speedway. He has all the charm and charisma of the best of American riders, and has already taken the sport to new levels. As well as orchestrating the unique Team Exide sponsorship package with Hancock, he has launched an engine tuning business and is currently expanding Bullet Enterprises as a respected force in speedway machinery. He made many friends and many memories with the Heathens; Countless match winning performances and last ditch 5-1 maximums, the wheelie show that would light up the end of the night at Dudley Wood and of course the last bend wheelie against Swindon where he fell and cost us the match! 'Hamill and Hancock' were synonymous with Cradley throughout the 90s and no-one can deny that the pair deserve such credit for their efforts. Billy joined Greg at Coventry in 1998 after spending the previous year on loan to Belle Vue. In '99 he was briefly squeezed out of the Bees line-up under the points limit, but brought back to Britain when team manager Colin Pratt made expected early changes to the line-up. The Bullet quickly made up for lost time with a classy maximum against the Wolves. Internationally, he followed his 1996 World Championship success with second place behind Hancock in 1997 and then picked up the World Pairs Championship in ’98. The Grand Prix of the same year started badly though, and finished even worse for this American though. A worrying injury in the final round, meant that he finished 9th overall, and needed a permanent wild card to compete in 1999. It took several months of recovery before Billy was looking anything near his best, but all the old signs were back by the end of the year. The bullet is now firign on all cylinders again and on top World Championship form. He and the family (wife Christina and two children) are based in Sweden throughout the year. 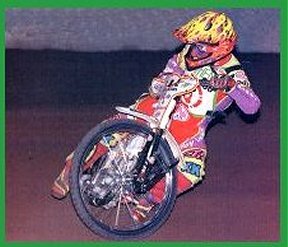 Copyright: Steve Johnson & Cradley Heath Speedway Ltd, 2002.